India's southwest monsoon normally occurs between June and September and is known for being a summertime rainy season. This year's monsoon has been assessed as average but India's Meteorological Department statistics show that daily mean rainfall for the country has recently been above normal. At least 15 people were killed by floods and landslides in India on Wednesday July 11, 2018. So far this year, close to 200 deaths may have resulted from India's heavy monsoon rainfall. At NASA's Goddard Space Flight Center in Greenbelt, Maryland, estimates of rainfall accumulation were constructed using data from NASA's Integrated Multi-satellitE Retrievals for GPM (IMERG). GPM is the Global Precipitation Measurement mission satellite that estimates rainfall around the world. Algorithms developed by NASA's Precipitation Measurement Missions (PMM) science team at Goddard were used to merge data from satellites in the GPM Constellation. The IMERG analysis showed rainfall accumulation during the week from July 9 to 13, 2018. 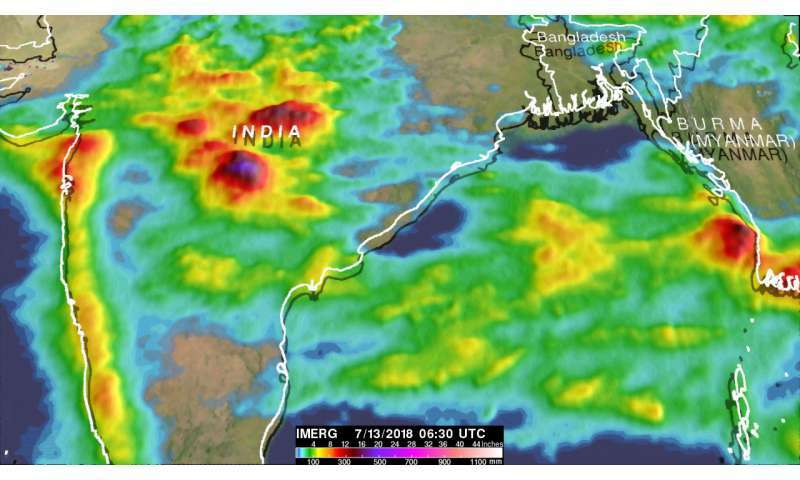 During this period the locations of most of India's heavy monsoon rainfall remained nearly stationary or increased in size while the area of Bangladesh's heavy rainfall shrank. The data showed heavy monsoon rainfall along India's Arabian Sea Coast and large areas of north-central India. During this period at least 525 mm (20.7 inches) of rain was reported in Mumbai, India.